Miso Crafty Knits: Happy Canada Day!! The little family and I will be enjoying the day of the Maple Leaf by having a BBQ with friends, enjoying the sun, and venturing out to the Parliament building and Harbour to see the action...normally we would avoid such congested festivities, especially with the little one in tow, but since we live 2 blocks away we figured it would be ok. To prepare for Canada's birthday, Brett bought flags and put them out on the deck so that they can wave gloriously in the wind. 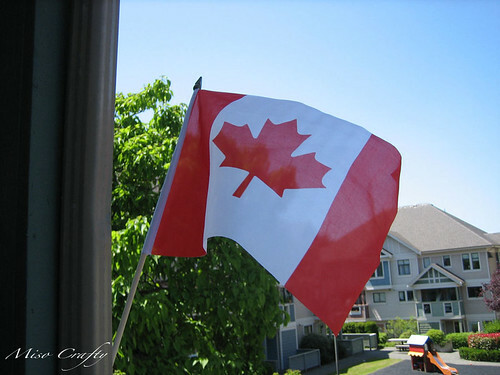 I hope everyone has a great Canada Day!